With releases from the likes of Ariana Grande, Backstreet Boys and Sean Paul, this week’s New Music Friday is a seriously star-studded affair. And, thanks to Becky G, it just got significantly sexier as well. Today (January 18) the 21-year-old rolled out her new single “LBD.” We already knew the track was going to be a banger based on several teasers that popped up on social media. However, the trap-influenced release exceeds expectations. “Every time you see me with my little black dress on, know you need me. Say you wanna freak some, I can see it,” she confidently coos on the chorus. “You wanna be grown – no Rated PG. Baby you should know that I ain’t easy.” Moving into Spanish on the bridge, the diva serves vocals and imbues the release with serious sass. She does the same in the just-released lyric video, which follows in the footsteps of the cartoon-inspired cover. After closing out 2018 alongside Anitta and Maluma on a remix of “Mala Mia,” this is the perfect way to usher in the new year. With any luck, it will net Becky a well-deserved hit. If nothing else, it is all but guaranteed that the accompanying video will be a glamorous feast for the eyes. The triple threat (singer, actress and makeup ambassador) is on a hot streak when it comes to viral visuals. She dominated YouTube with “Mayores” in 2017 and “Sin Pijama” in 2018. Both have amassed more than 1 billion (yes, billion with a B) views each. 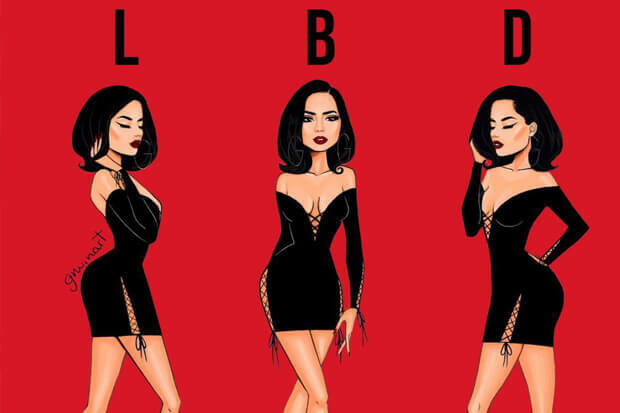 Could “LBD” be next? Watch the lyric video below.